HOUSTON -- The pilot of a plane that crashed near a Houston airport halted a third attempt to land just before it plummeted to the ground, killing all three inside, the National Transportation Safety Board said Friday. It's unclear whether the pilot made a distress call just before the crash that happened Thursday afternoon near Hobby Airport, NTSB investigator Tom Latson said, and that initial information indicates the female pilot didn't make any other calls to air traffic controllers after she waved off the third landing attempt. He described the crash as a "violent impact." "During this (third) approach, the pilot decided they would make a go-around themselves without direction and announced they were going around and began climbing out to the north," he said, adding that pilots are allowed to wave off an approach if they are not comfortable with it. The plane was in a flat spin before it plummeted to the ground nose-first, crashing into a parked car, CBS affiliate KHOU reported. No one was inside the car at the time. Audio posted on the website liveatc.net showed that the female pilot was told at least twice to turn around and make another attempt to land. She was also told that she was she's flying too high and has to turn around to land at Hobby Airport. The pilot can be heard nervously laughing as she says, "Trying to get down again." An air traffic controller says "no problem." Just before the crash, a traffic controller says: "Ma'am, ma'am, straighten up, straighten up." Records in the Federal Aviation Administration registry show the plane was registered to Safe Aviation LLC in Moore, Oklahoma, and had been manufactured in 2012. Officials with Safe Aviation could not immediately be reached for comment Thursday, and a phone listing for the company could not be found. The NTSB is still trying to determine how much flying experience the pilot had, Latson said, but that she had been flying the plane since the Oklahoma company that owns it bought it in 2012. Authorities have not released the names of the three victims. 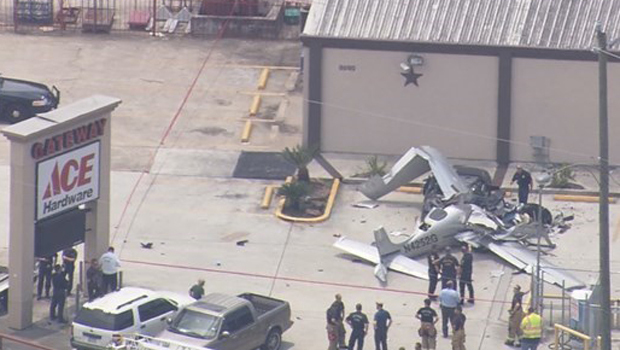 KHOU identified them as Dana Gray, the pilot, her husband, Tony, and his brother, Jerry. They were flying to Houston to visit the brothers' father at MD Anderson Cancer Center, the station said. The plane took off from Norman, Oklahoma, and had just been refueled, meaning it had about five hours' worth of fuel, Latson said, though he noted that it isn't clear whether the plane could have run out of fuel because both tanks ruptured in the crash. The flight-tracking website FlightAware showed that in the last 15 minutes, the plane's altitude greatly fluctuated, going from 1,800 feet down to 200 feet and back up to 1,200 feet before crashing. NTSB's final report on the crash will take six months to a year, Latson said.